Home » Posts Tagged "best place to stay in Door County"
September is one of the best times of the year to visit Bay Breeze Resort in Ephraim, Wisconsin. The weather in Door County is spectacular with warm days and cool nights, the leaves are getting a hint of color and there is an ample amount of activities to keep you busy. In the evenings, retire to the comfortable, well-appointed guest rooms at Bay Breeze Resort. Our suites feature gas fireplaces and are a great place to relax and recharge for the next day’s adventures. Two bicycling events are on the calendar, with the Door County Century Ride on Sept. 13 and the Peninsula Century Fall Challenge on Sept. 19. While they both have “century” in their name, the rides offer shorter routes so anyone can enjoy seeing the area’s majestic scenery from their bike. Bay Breeze Resort is the best place to stay in Door County for these rides since we are right in the middle of the peninsula and close to both routes. Bay Breeze also offers Kohler rain showers and whirlpools to soothe your muscles after spending time in the saddle. Another September highlight is the first annual Ephraim Hill Climb and Concours on Sept. 11-13, featuring classic pre- and post-war vehicles. The event includes the Kurt Bakkelop, which is Norwegian for short hill climb. It is a beautiful, challenging course for these vintage vehicles winding its way through Ephraim’s picturesque streets and nearby hills. Cars are also the focus of Baileys Harbor Autumn Fest & Classic Car Show on Sept. 25-27. 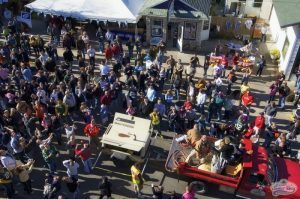 Besides plenty of vehicles on display, Autumn Fest features arts and crafts, live music, and great food and drink. That same weekend, you can also head over to Fish Creek for great shopping deals during the annual Fish Creek Inside Outside Sale. While there is plenty going on, don’t forget to take some time to relax – something easy to do at Bay Breeze Resort. We offer 12 room types featuring queen and king size beds, garden and harbor views, Kohler rain showers and whirlpool tubs, and patios and balconies. The resort also has its own private sand beach with Wi-Fi access, an outdoor heated pool and whirlpool (open through Sept. 13) and award-winning gardens. Beginning mid-August, we charge off-season rates during the week – another reason to stop and check out the best place to stay in Door County. For more information on the perfect Door County lodging choice for your getaway or to make reservations, call 920-854-9066 or email [email protected].